Happy Monday, and Happy Hanukkah! Last night, Hanukkah festivities have already begun! We came to the classroom, and remembered that Kiki wasn’t going to be here. “It’s her happy birthday trip,” R reminded us when we had our circle time. On the big table, we saw some paddle– looking things. There were paper clips and beads on a tray. When we used the paddle– looking things, it picked up all the paperclips! It’s actually a magnet! On the other table, we had our favorite Zingo! game. Our library was pretty busy as Goh– san read books to us. She was delighted to look at our life books, and we were delighted to have her in our class. After an early morning snack, Miyashita sensei came and we practiced our balance again by hopping on one foot– it’s still a bit tricky though, but you know what they say, “Practice makes perfect!” E demonstrated how we should balance on one leg, and J showed us how we can balance as we sat down with our legs up and our arms by our sides. We also did some forward roll action, and most of us can do it by ourselves– HOORAY! 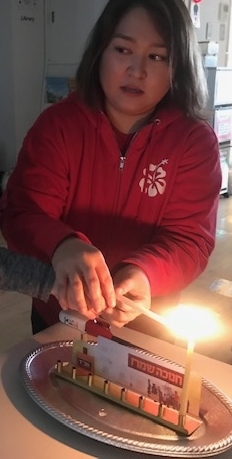 We had our circle time afterwards, and Pauline brought out something with candles; she said we were going to do something special. “Do you know what’s this? Do we sing ‘Happy Birthday’?” she asked. “It’s for Hanukkah,” M said. “How many candles, how many candles….” S started to sing. “That’s right, this is for Hanukkah,” Pauline said. She said it’s called a Hanukkiah. The menorah that she talked about before, looks like the one just at the bottom part of this journal border design. We were about to light two candles (For yesterday and today), but Shelley came in and said that last night was the start of Hanukkah, so today counts as the first day; tonight will be the second night of Hanukkah, so tomorrow will mark the second day. “Oh! I see!” Pauline said. “Thank you Shelley!” We all said to her, and Pauline took away the second candle. “Okay, we’re going to light the candle,” Pauline said. “Do you know what this is?” she asked. We didn’t know what she was holding up. “No, because it’s fire inside!” R cautioned. “Then the whole house!” J cried out. “That’s why only adults can use this,” Pauline said. “Do you know who adults are?” she asked. “Mommy and daddy and teachers,” R said. “Grandma and grandpa,” B chimed in. Pauline confirmed that they were right. “— shamash,” Rz supplied for her. Pauline nodded in agreement. She started singing happy birthday again; the response she got was a mixture of groans and “Noooo”s. “Okay, seriously now. Before we light the candles, we need to say our thanks. So, let’s think of things that we are thankful for…” Pauline began. “I’m thankful for Kiki, Pauline, Sayaka, and Goh– san,” R said. “Because I like them,” he explained. “I’m thankful for Pauline,” R and R said. “Because you’re doing this,” Rafael told us. “You’re doing Hanukkah,” R said. That was really sweet! “I’m thankful for the taxi station,” S said. “I like look at it,” he said. R then helped Pauline hold the shamash and we lit our first candle. We sang “How many candles?” afterwards. We didn’t have time to go to the park, so we Pauline did a puppet show for us. She told a story of a girl named Chivy, who lived in Cambodia with her friend Maly. They both went to a school, which was just under a tree. They were so happy– except for when it rained. “Their clothes are wet,” S said. “Chloe,” R told her. C blinked in surprise, then grinned. So the girl named C was sad because they couldn’t go to the park– but was happy at the same time because they were warm and comfortable inside. “They don’t have Ohana,” L commented, pointing to the puppets which we were using for the Cambodia part. He was right! In the story, the Ohana children helped Chivy and the rest of the Cambodia children by donating their toys, books, and clothes. They all became friends in the end as they exchanged letters and pictures. We told Pauline that we want to be friends with the children in Cambodia– just like the story! She suggested that maybe one time we can write a letter to them, too, so we can get to know them better. So that sums up our Monday– how was your day?